Ken Pavlou just e-mailed me the link below, the sign up for Corvair College #29, it is now live and on line, builders may sign up at any time. I suggest making a plan right away, because we are only effectively seven weeks away. Time to make a plan now. CorvairCollege #29, March 28-30, Leesburg FL. A GREAT MOMENT FROM CC#17: Steve Sims of the Florida Panhandle assumes the famed “Superman Position.” This is where you lie prone on the bed rail of the pickup truck the run stand is bolted to, and “Fly” behind your Corvair engine running for the first time. CC#17 was the first College Arnold Holmes hosted. He runs great events. Steve’s plane, a 601HDS, is now flying with this engine he built. I am planning on having him fly it back to CC#29, but I insist that he do it from inside the cockpit. We have fun at Colleges, but there is also a lot of serious learning and progress. Don’t miss it. Photo taken January 25th in our backyard in Florida: The illustrious Ken Pavlou is on the left, Grace in the middle and Peter Shean. 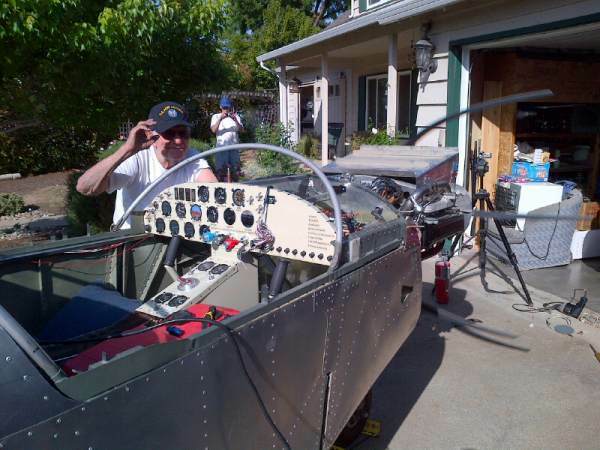 Ken and Peter are both 601XL builders with 95% complete airframes and first class 2700cc Corvairs for them. Ken runs all the on-line registration for all the Colleges out of his home in CT. I received two emails asking about the plane pictured below. It is for sale on Barnstormers.com. Part of the add says “William Wynne engine”. This is not entirely accurate, but I don’t think it was done with ill intent. The plane is simply being sold by a friend of the builder who passed from this earth, and he is just offering a general description. The plane is located in Eastern Georgia. The builder was a very experienced homebuilder, but I have never seen this plane in person. If someone wanted to look into buying this plane, I would highly suggest calling Dan Weseman for more input. On the surface, it seems like a very good beining point, that might need a through going over and a new cowl from Dan. If is a much better starting point than any of the Corvair/Sonexes that have rear starters and mounts that were not made by Dan. Above is the latest incarnation of the now Bankrupt “Aeromax LLC” and just like last time, this is again run by Bill Clapp. I highly suggest that no one buy anything from him. I left a long post about him on the Zenith Matronics site, there are also many other ones on Mark Langford’s CorvairCraft list, and the factory Zenith list. You can contact many People such as Pat Panzera from Contact! magazine or Rick Lindstrom from kitplanes to get their input. Make up your own mind, but there will invariably be people who get taken by this, just the way that Aeromax took people in 2009-before going bankrupt in 2011. Don’t be one of them. I often complain about disinformation on internet discussion groups, but I don’t often provide examples. Well, in the interest of humor, maybe we should look at a few….. The internet isn’t new anymore, and you would think that by now most people writing to discussion groups would know their comments will have a very long shelf life, and this equally applies if they are brilliant or if they are Bull. Actually, I suspect many of the people on these groups know this, and that it why the don’t use their names. Yesterdays “Flyboy26” who said something stupid becomes “Conexpert21” with a clean history tomorrow. OK, where do we start? – We don’t run the engine at it’s automotive power setting nor rpm limit-Painting the pushrod tubes is to protect the O-rings, has nothing to do with oil temps- It wasn’t designed as an airplane engine, that is why we converted it into one – Dan’s bearing is $1,050 and building a cheap engine wasn’t a goal, building a good one is. – Two Piets with no radius on the grind broke a crank , no damage to either plane. More than 100 Corvair Piets have flown, less than 10 have a 5th bearing.- I have well documented examples of dramatic performance increases with Corvairs and 68″ props over small Continentals with 72″ props.- 2500rpm on a 72″ prop at 60mph is barely above .7 mach at the tip. All direct drive certified engines since WWII are either 2700 or 2800 rpm rated, often with props well over 72″ in diameter. Steve Wittman disproved the slow prop myth with his Buttercup…in 1937. (He used a 64″ prop at 3,400 rpm on a plane that flew slower than a Piet) – you only need torque at 2000-2500 rpm if you have to run it at that rpm, and you would only do this if it is a pre-war design with old metallurgy like cotter-pined rod nuts. OK, why am I bringing this up? First, because if anyone Googles “Pietenpol Corvair” that top quote comes up as if it was written yesterday. I write a lot about how builders are subject to continuous disinformation in the guise of helpful advice. If that is what they hear all the time, and they have not see a Corvair fly a Pietenpol in person, ‘theory’ like this seems real. “Because it’s an exact science. You can’t call up Continental in Mobile AL, and get a Zero time C-85 for $6K. (Small problem, they have not made a C-85 in 44 years and do not offer Zero time ones) It is worth noting that the 85 has a nearly identical parts count to a 0-200, and a zero time version of the latter is well over $18K…if you already own a good core. Let’s just say that a builder doesn’t know the difference between the FAA terms, Zero time, Overhaul to new limits, and overhaul to service limits. The last is not even vaguely comparable in quality or lifespan compared to the first, and I do not believe that there is a single C-85 for sale in the country with an actual legal logbook with an entry that that meets even the definition of overhauled to service limits, with the yellow tags and the accessories for $6k. Not even close. Grace’s Taylorcraft has a C-85 engine in it, and the parts alone to overhaul it correctly cost $8800 in 1999, and this did not include buying the engine nor any labor, just the parts to overhaul it. The only C-85 you will find for $6K is one made of well used parts and a fresh paint job. That isn’t “Zero timed”. The key words are “experimental only” and “no logs” when you see these engines for sale. That means they contain parts that are not legal for use on Certified planes. Such an engine will never make TBO, and if you are unlucky, it will break. When it does, you will then find out that many aircraft shops and mechanics will not touch your $6K engine. Ask any person who works in a FAA licensed repair station about having out of spec parts in the shop. When I ran the MT propeller repair station the FAA inspectors required all out of spec parts to be marked with a stamped X and kept in a locked room for condemned parts that only the director had keys to. If you have out of spec parts around, they might get into certified engines, and then the repair station gets it’s ticket pulled. That is why professional shops don’t work on junk. I like Continentals, and have a lot of time flying behind them. Their primary quality is reliability. but you only access this quality by spending top dollar to keep the engine the way that it was from the factory. Anyone who thinks that you can have the reliability of a certified motor when you buy one that is advertised as “no logs” or “experimental only” is on drugs. You don’t get to have it both ways. Continental’s reputation was not built on engines made of junk and spray painted. If the engine was just as reliable with out of spec parts, then they wouldn’t be out of spec would they? There are always people who argue that they have to have “a reliable certified engine” and that they will not fly auto engines. Then the first thing they do is go out and look for the cheapest collection of parts bolted together that are masquerading as a “certified” engine. That behavior isn’t rational, but people who are compulsively cheap often are satisfied with the illusion of reliability instead of the real thing. Want to know who isn’t fooled by this? Our old friends Physics, Chemistry and Gravity. If the FAA considers the engine un-airworthy in a certified plane, it is just as un-airworthy in an experimental one. Physics, Chemistry and Gravity don’t care if the plane was built in a factory or your garage. An engine built of out of spec parts doesn’t magically become airworthy when it is bolted on an experimental. “I have a recommendation for an excellent shop in Canada, with whom I’ve worked for 20 years. My O-200 was zero’d there few years ago, and I’m very happy with it. PM me if you like. That the “pilot DAR” doesn’t know what he is speaking about, because you can’t get a zero timed Continental from anywhere but the factory, and the factory is 1,400 miles south of the Canadian border. If you are building a Corvair and looked at Dan’s $2,200 new billet crankshaft and thought it is a good value, you are right. If someone thought that was expensive, they better not buy a worn out, undersized or previously prop struck Continental, because their new cranks cost a lot more than that, and don’t forget, they will have spent $6,000 on their ‘core’ engine, not the Corvair average of $200. Overhaul Your Engines Price includes fuel system, magnetos, starter, new harness and spark plugs. Price is contingent on repairable crankcase, crankshaft and cylinders and subject to applicable air worthiness directives and service bulletins. I don’t want to leave anyone with the impression that I think the internet is all bad. After years of having damage done by bull stories on the internet to my work with the Corvair, my new approach is to directly point out disinformation in hopes of getting people to recognize this type of story comes from people who are not an asset to home building.